77 years after Fred Perry raised the Wimbledon trophy Murray proved more than worthy of the honor. 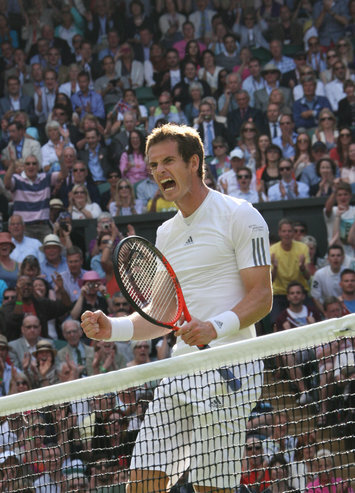 WIMBLEDON — As good as he is, there was never any guarantee that Britain’s Andy Murray was going to win Wimbledon. Sure he had the game to do it, but he was close to grabbing the title in 2012 before Roger Federer ran away from him. Rafael Nadal had throttled him a couple of times. Andy Roddick had faced him down. But this year the ultra-serious Scot came into the tournament is his best position ever. Not only had his all around game firmed up, but also he had actually proved to himself that he could win a huge event at home when he won the Olympic gold at Wimbledon last summer. Had he not managed to turn the tables on Roger Federer in London during the gold medal match after his sorrowful loss to him in the 2012 Wimbledon final, would Murray have been able to hold his nerve in the final game of his 6-4, 7-5, 6-4 victory over Novak Djokovic to become the first British male in 77 years to win the Wimbledon title? Perhaps not. Some weeks after the UK celebrated his gold medal run, he showed himself that he could hold up a major trophy when he took down Djokovic in five sets and won his first major at the US Open. Throw in his first victory over Roger Federer at a Grand Slam in the semis of the 2013 Aussie Open, and he came into Wimbledon within enough inner belief to be able to survive what were sure to be some emotional ups and down. There was no reason to completely put aside his three losses to Djokovic post New York, especially the Aussie Open final, but given how similar their games are, how close their matches tend to be and the fact that they have known each other since they were 11, there was no intimidation factor. Add in a raucous crowd — and I mean an unusually loud crowd for a final on Centre Court – and there were a lot of positive elements going into the match for Murray. While Murray has a large team he praises up and down and he clearly he appreciates all their contributions, it has to be noted that since he brought in Ivan Lendl to coach him in December 2011 that his results at the majors have vastly improved. Lendl is the first former super elite tennis player to become a standout coach. He talks and Murray listens. Lendl’s ego is also in check to the point where he doesn’t need to seize the spotlight. He actually left before any media could speak to him on Sunday. He told Murray to go for more speed with his first serve and strike his forehand with more force. He also convinced him he was as good as anyone else out there. And now he is and on some surfaces, perhaps better. Murray played a very good match, but he did not have to be at his best to win it. Six-time Slam champ Djokovic put in his worst performance in major final ever, littering the court with unforced errors, blowing some key points at the net and perhaps having his worst serving day of the fortnight. He didn’t attack second serves and he didn’t go for the lines. Most disappointingly, when he did play well in patches he could not sustain his level. Up 4-2 in the third set it looked like he would take it to a fourth set and from there — on a court that was said to have temperatures over 100 degrees — he might have been able to wear the Scot down. But he was outplayed and outs of sorts. Perhaps it was because his confidence was shaken after he couldn’t sustain a break lead against Nadal in the fifth set of Roland Garros. Maybe it was because Juan Martin Del Potro put a dent in him in their classic Wimbledon semifinal. Whatever the case, this is no longer the dominant Novak of 2011. The biggest test for Murray came in the final game of the match, when he got off to a 40-0 lead and then he became super nervous. He lost a long point on a Djokovic forehand volley winner. Then he hit a very weak second serve and the Serbian nailed a leaping backhand return winner. Murray then wished a first serve in that was well long and made a desperation challenge. He followed that up with a shaky backhand long. Three match points were gone and then Murray pushed a forehand into net. But that’s when the Scot began to rally again. On break point for Djokovic, a Murray serve at the body forced an error. At deuce, Djokovic hit a gorgeous touch drop volley winner off a low passing shot attempt. Murray then fought off another break point with a forehand crosscourt winner, but then the Serb flipped an angled forehand winner off a fine Murray drop shot. On Djokovic’s third break point, Murray crushed a huge forehand down the line and then put away a volley. Then Djokovic finally faltered. He misplayed an overhead that ended on a Murray forehand pass. Match point No. 4 and Fred Perry ‘s ghost was finally exorcised when Djokovic put a backhand into the net. Murray dropped to his knees, and put his face into the grass. Great Britain finally has a male Wimbledon champion again and a guy that should eventually seize the No. 1 ranking and clearly become the world’s best player. A player of the same level as well—Fred Perry.